According to the Census Bureau, building permits were up nationally 2.7% from June 0f 2013 and account for 943,000 for the year. That is a 12% uptick from July, 2012. Housing starts showed nearly 6% growth from June to July this year and was the largest increase of the 3 categories with 21% from 2012. Housing completions came in just under 2% from June to July and a 15% increase year over year. 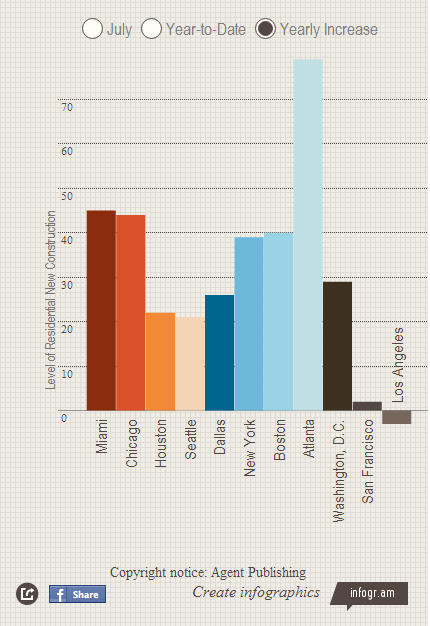 The main factor driving these numbers was due to multifamily projects. Chicago’s, yearly increase was the most promising, although only ranking 10 out of 11 of the top producing cities in new construction “dollars and cents”.. Chicago showed a 44% increase this year in new construction, only being topped by 2 other markets. Miami showed a 45% yearly increase and Atlanta… well let’s just say, it wasn’t even close. Atlanta reported a 79% yearly increase in new construction. Third place isn’t so bad Chi-Town.